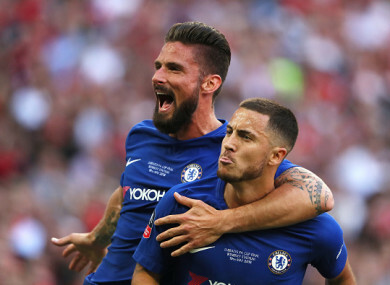 Olivier Giroud and Eden Hazard celebrate taking the lead. Email “Chelsea claim FA Cup at Wembley thanks to decisive Hazard penalty”. Feedback on “Chelsea claim FA Cup at Wembley thanks to decisive Hazard penalty”.